Familiarity is important when you’re in a foreign place. It can be hard to find when you’re nearly 10,000 km from home. Being in a foreign land, struggling to understand foreign languages and adapt to foreign customs can make it seem like so much more. But it’s the little things that close the gap; it’s the little things that remind you that home is never far away. Outside the wire security fence of the Expo village is a small block of apartments. They’re nothing spectacular, very much like any other apartment complex you might see throughout the world. Shaped like a box with the buildings on the outside and a courtyard on the inside, you’ll find parents playing with children, grandmothers and grandfathers taking a rest and a small, concrete soccer pitch. That is my little thing. On my second day in Astana, I went to the mall and bought a soccer ball. 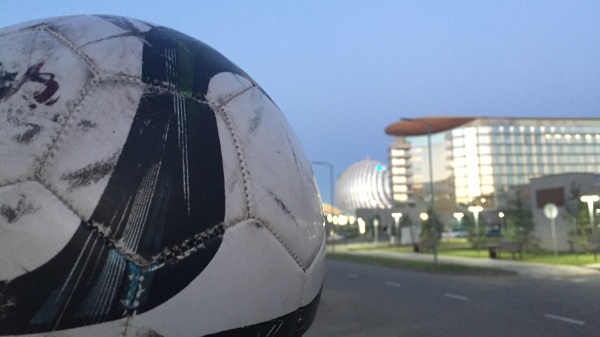 In the same way one might buy a restaurant guide or take a bus tour to explore a new city, I knew this ball would be my introduction to Kazakhstan’s capital. When the work finally died down and I could escape my computer, I joined a few of our Student Ambassadors on the pitch. None of us are professionals. In fact, we’re hardly any good at all. But for all of us, there was familiarity in that hidden slab of concrete surrounded by metal bars and netting. There’s a familiarity in the touch of the ball, the weight of the pass and the sound of a shot hitting the back of the net. It didn’t take long before we had visitors. A few of the neighborhood kids came out to join us, and if their skill is any indication, watch out for Kazakhstan in the 2026 World Cup! They didn’t speak much English, but a few of my colleagues spoke Russian and Kazakh, so names were exchanged, teams were chosen, and play began. There was a familiarity to one kid’s shirt; the same Messi kit I have at home. There was a familiarity to the movement off-the-ball, the frantic call for a pass and an encouraging ‘high five’ for a goal. Soccer is a sport I have played all over the world. It is a piece of home I have brought with me from Santa Cruz, Bolivia to Seattle, and from Washington, D.C. to London. Expo may be about ‘Future Energy’, but at its core, it is about familiarity. It is about finding the familiar in one another and finding the common bonds to build a better future. It is about realizing that we are more alike than we are apart, and that our homes may be thousands of kilometers away, but there are reminders all around us. Astana may never be home. I may never learn the language or brave the winter, but thanks to Expo, I found something familiar, and in that place I felt a little closer to home.